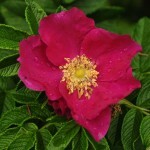 Highly fragrant, single, magenta-red roses don the branches of the red rugosa rose. Flowering can occur all season but is most prolific in the first flush of spring. 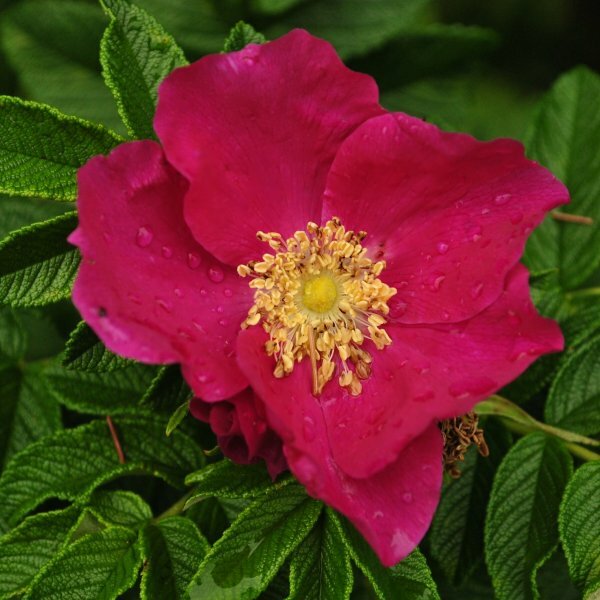 The rugose leaves of this tough shrub rose are deep green and moderately resistant to fungal disease. Very large pomegranate-like hips of tomato red grace the branch tips later in the season. This was originally distinguished as the naturally occurring variety rubra but has been in cultivation so long it is now distinguished as a cultivated variety. It has been in cultivation since the mid-19th-century. Cold hardy, beautiful and tough, rugosa rose is a dense, thorny shrub rose native to eastern Asia. It is admired for its beautiful flowers and fruits as well as its resiliency to cold, high winds, ocean salt and drought. It has been introduced to North America and has naturalized across a large area of the northeast and Alaska. The canes of rugosa rose are thickly covered with small, sharp thorns and compound rosaceous leaves with coarse, green leaflets that turn yellowish gold or bronzy shades in fall. Strongly fragrant, single, pink flowers with yellow stamens appear from early summer through the end of the growing season. White and deep pink flowered variants are also available. Once pollinated by bees and other insects, large, conspicuous, globose rose-hips follow. These turn bright orangish-red and are edible. In fact, they are rich in vitamin C and good for making rose hip jam. Germination 1. Drop the seeds into a container filled with 1 cup of water and 1 tsp. of hydrogen peroxide. Leave them to soak for 24 hours. Remove them and pat them dry. 2. Line the bottom of a plastic freezer bag with 2 inches of moistened peat moss or vermiculite to cold-stratify the rose seeds. Scatter the seeds over the peat moss. Then cover them with another inch of moistened peat moss. Put them in the refrigerator for eight weeks. 3. 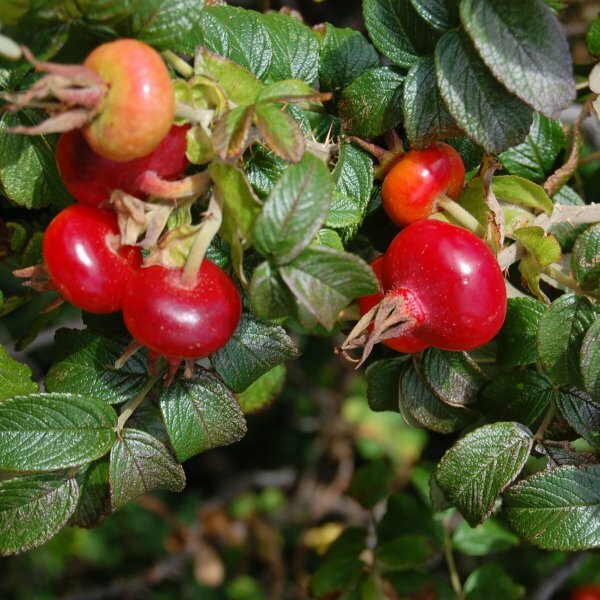 Plant the rose hip seeds 1/2 inch deep and roughly 1 inch apart in a seed tray filled with a moistened mixture of one part sand and one part vermiculite. Store the tray in indirect sunlight for the first four weeks. Then place the tray near a sunny window. The seed should germinate in two to three months. Keep the soil in the tray moist at all times. Touch the surface frequently. If it is dry, spray it with water from a spray bottle. Use a paper towel to blot any water that pools on the seedling's foliage.